All members of the deer family (cervids) grow and shed antlers every year. Antlers grow at an incredible rate of speed, and therefore are considered the perfect renewable resource. Velvet antler is the blood filled collagenous matrix that forms the rapidly growing antler structure. Velvet is the outside covering of the antler during the growing period. We refer to velvet antler as the stage that we harvest it in, which is approximately the 67th day. Harvesting the antler at the right time is crucial as it holds the most active ingredients within it at that time. The velvet covering is not for human consumption and is scraped off during processing. The rest of the whole antler is ground up into powder. Click on the links to learn more about these components. The information is for educational purposes only and this product is not intended to diagnose, treat, or cure any disease. Chondroitin sulfate is considered a promising treatment for osteoarthritis. It is most often used to treat osteoarthritis of the finger, knee, hip joints, low back, and facial joints. Research has mostly focused on knee osteoarthritis, with fewer studies conducted on other joints. Clinical trials suggest that chondroitin may have significant effects when compared to placebo. Pantocrine is mainly used as a rejuvenating and regenerating agent. Short-term use is believed to quickly build strength and power, while consistent long-term use has proven to rebuild deep life force, preserve youthfulness, reverse aging and enhance longevity. Glucosamine is a naturally occurring substance found in the fluid around our joints. 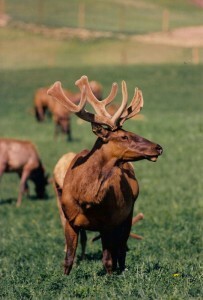 It is naturally present in elk velvet antler. Glucosamine plays a vital role in building cartilage and is commonly consumed as a supplement by people with arthritis, especially osteoarthritis. Amino acids are the basic building blocks of the body. They are also sources of energy, like fats and carbohydrates. However, amino acids are structurally characterised by the fact that they contain nitrogen (N), whereas fats and carbohydrates do not.Therefore, only amino acids are capable of forming tissues, organs, muscles, skin and hair.The importance of amino acids as the precursors of enzymes and neurotransmitters is often underestimated. As such, amino acids regulate almost all of the metabolic processes in the human body, and they are essential for a healthy body. Along with omega-3 fatty acids, omega-6 fatty acids play a crucial role in brain function, and normal growth and development. As a type of polyunsaturated fatty acid (PUFA), omega-6s help stimulate skin and hair growth, maintain bone health, regulate metabolism, and maintain the reproductive system. Collagen cartilage found in velvet antler shows effect; reduction in pain and stiffness in joints, restoration of cartilage, reduction in susceptibility to lumbago, improved general mobility and benefits to knee and finger joints. Velvet collagen has also demonstrated to be a healing agent when applied as a topical skin treatment. We find hyaluronic acid in our body joints. It improves bone density, strengthens muscle, and reduces fibromyalgia. Hyaluronic acid also lubricates the fluid in the joint tissues, prevents the fluid from breaking down, and absorbs shocks. We expose our joints such as the knees and spinal column to stress and pressure on a regular basis. Hyaluronic acid forms protective mesh-like molecules around cells, giving connective tissue rigidity, viscosity and elasticity. Furthermore, it removes waste products, often acidic in nature, arising from the destruction of the cartilage and hence easing joint pain. As an antioxidant, it supports joint health by protecting joint destruction from free radicals. Velvet antlers have been used since ancient times as traditional medicines in the Orient and throughout Europe. Ancient writings about its medicinal properties go back several thousand years. Worldwide, over 250 articles, summaries and reviews have been published on the studies and research on velvet antler. Research has been conducted in Russia, China, Japan, Korea, New Zealand, and Canada.